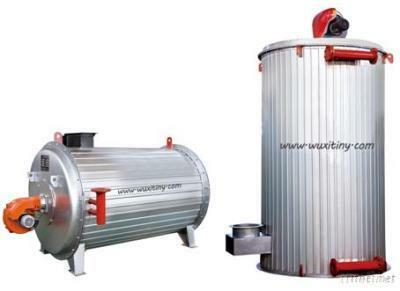 Oil/gas fired vertical/horizontal organic heat carrier boiler is the packaged forced circulation boiler. The compact heating area comprises of inner, middle and outer (or inner and outer) closely aligned round coils. Inner coils are the radiation heating area, while middle and outer coils serve the convection heating area with external surface of inner coils. Fuel fires and generates heat in the combustion chamber of inner coils. Most heat is absorbed by the radiation heating area and residual hot fume flows in the convection heating area for heat exchange. Finally low-temperature fume exhausts outside with chimney via the fume outlet of boiler. Extremely flexible and simple installation. Just place the boiler on the foundation. The closely-aligned round coils form the sufficiently arranged heating area to reduce the surface heat load of pipe and handle the heat conduction oil safely. Compact structure saves the space of boiler room greatly. Air preheater is mounted at the rear of large boiler to improve the efficiency.